If you want to be Nisha Millet, Rahul Dravid or Ashwini Nachappa, one of your basic requirements would be to eat right. 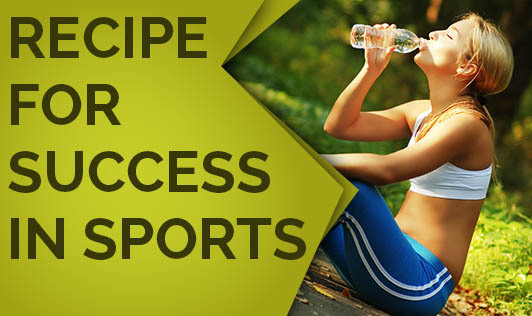 A sportsperson has to balance the food intake in order to make the best use of nutrients. Food fuels anything from short bursts of intense activity to sustained efforts for hours. Food must also build muscle power, boost stamina and increase endurance. Best results can be obtained through a combination of physical training and good nutrition. "The concept of sports nutrition is not well developed in our country except among the elite sportspersons," says Dr Hemant Kalyan, a specialist in sports medicine and an advisor to Sports Authority of India. The metabolic needs of endurance athletes (long distance runners, cyclists, etc) are different from intermittent activity athletes (football, hockey, cricket and golf). Body-building sports other different needs. The primary requirement for physical activity is energy. Energy can be obtained from carbohydrates, proteins or fat which in turn are available in the food you eat. CARBOHYDRATES: This is the best type of fuel. Our bodies store carbohydrates as glycogen in the liver and muscles and as glucose in the blood. Most of the carbohydrates should come from starchy foods like rice, chapati, bread, jowar, ragi, pasta, corn, dried pulses, potato, tapioca etc. These foods also contain some amount of proteins, vitamins, minerals and fibre - all of which are essential for the body. Simple carbohydrates (sugars) can be obtained from fruits, honey, sugar, jaggery, skimmed milk etc. The total intake of carbohydrates has to be more than 60 per cent of the calories. This means if you consume 2000 calories per day you should get at least 1200 calories from carbohydrates, - you need to eat at least 300 gm of carbohydrates. Eat at least two hours before the training. After a training session, eat as much carbohydrate rich food as possible because glycogen stores should be replenished within the first hour of completing training or ending a match. This is the time when conversion of carbohydrate to glycogen is most efficient. Increasing glycogen stores is done to help delay fatigue and enhance staying power. Two or three days prior to competition, training is reduced or stopped and intake of carbohydrate is increased. Fat is kept to an absolute minimum. Overloading with refined carbohydrates or fruits might result in constipation or diarrhoea. For shorter events, training along with a high carbohydrate diet should be sufficient to build up capacity to store glycogen. PROTEINS: Protein intake increases with an increase in carbohydrate intake. An average intake of 12 to 15 per cent proteins is sufficient. Extra protein does not build muscle, it builds fat. Protein as fuel is expensive to the body. The waste generated during protein breakdown can be a burden on the kidneys. It also increases water loss. High protein and low carbohydrate diet will lead to dehydration, earlier fatigue and reduced performance because of lack of essential carbohydrate fuel and increase the risk of stress fractures due to accelerated calcium excretion. Exercise is the best way to build muscles, and carbohydrates are a sports person's best friend because they fuel the working muscles. Use of amino acid supplements to enhance protein intake is unnecessary. When the body proportion of amino acids is unbalanced, a negative nitrogen balance and subsequent loss of protein from the body can occur. On the other hand, low protein intake and misuse of anabolic steroids predisposes a person to muscular injuries, which happens in weight-lifters, according to Dr Kalyan. "Some of them use herbal remedies to boost muscle mass and in turn they deny themselves the protein which is required for the body," he adds. FAT: People believe that if they are active, it's okay to fill up on fatty foods. This is not true. High fat diets are a major risk factor in the development of heart disease and other health problems and sportspersons are not immune to these. Fat also uses up more oxygen for breakdown than carbohydrates. Training helps you to become more energy-efficient. You will be able to use more fat and spare glycogen. It is best to use low-fat foods in meals. VITAMIN AND MINERAL SUPPLEMENTS: A nutritious diet provides most people with everything the body needs but some rely on supplements. Though one may depend on supplements, in the long run it is wiser to change the diet. FLUIDS: The most consistent item of nutrition that is ignored in sport is water intake. As the body's fluid level drops, it could lead to dehydration. According to Dr Kalyan, majority of the people who are physically active, be it a regular at the local gym or an elite sportsperson, under-emphasise their fluid intake. Dehydration can damage the ability to perform well or even safely. "It can lead to cronic muscle cramps, lassitude and even spells of dizziness. This happens particularly in long distance runners and players in field games like football, cricket, etc. There is a strange concept among most people that one should not drink water when they sweat during vigorous physical activity," Dr Kalyan adds. The quantity of water to be taken depends on the intensity and duration of the activity, the weather and amount of sweat. As a rough guide, adults need about two litres of water per day. An extra liter for each hour of exercise should be useful. When thirst is insatiable, drink plenty of water. Dr Kalyan advises not to wait for thirst because thirst is a late indication of a sub-clinical dehydration. The colour of your urine is a good indicator if there is sufficient water in your body. If the urine is pale yellow, you have enough water. If it is darker, drink more. A pre-event meal has to ensure that glycogen stores are filled, prevent blood sugar from falling too low during the event, remove hunger pangs and ensure the fluid levels are high. The best time to eat a pre-event meal would be two to fours hours before competition. The ideal meal would be a high carbohydrate, low fat one. Fatty food slows digestion and sugary foods will affect blood sugar and insulin levels. Avoid caffeine and alcohol because they increase the risk of dehydration by drawing out water from the body. A pre-event meal can be worked out individually to suit each one's comfort and the event. There is no substitute for a thorough, well-planned training programme and the right diet. There is a need for sportspersons to have proper nutrition before, during and after the games. These, along with adequate rest, sleep and the right mental approach, remain the most important ways to perfect performance.